India has suffered a huge lag in its adoption of next generation of telecom networks. 3G, which is the third generation of mobile networks offering faster data speeds, is only now being rolled out though the auctions were held in April 2010. 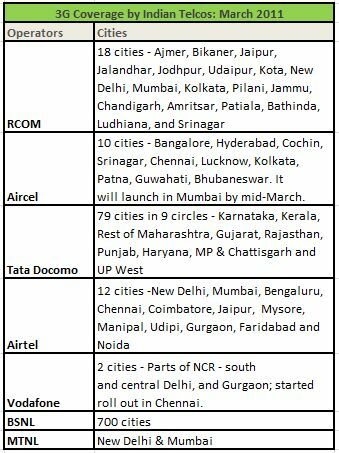 While BSNL and MTNL, the two government owned telcos, got a head start with 3G roll outs and have covered huge grounds, private cellular operators are slowly and steadily rolling out across India starting with the circles in which they are already strong. Industry sources warn that rates are not going to be as competitive as the current GPRS networks. Vodafone, for example, is charging a whopping Rs 10 per MB or Rs 10,000 per GB in New Delhi, according to OnlyGizmos. When contacted by TechCircle to confirm the rates, the company refused to comment. Aircel has more affordable plans -- Rs 132, Rs 252, Rs 502 and Rs 802 the consumers can download upto 75MB, 150MB, 350MB & 1024MB data respectively for a month with inbuilt voice & SMS. In addition to this, there are other data plans such as Rs 92 for 100 MB. BSNL tariffs are available here. Its prepaid plans start at Rs 275 for 0.5 GB and goes up to Rs 3000 for 35 GB. Tata DoCoMo's rates (for Bangalore) start from Rs 350 for prepaid connections for 200 MB data download limit and up to Rs 2000 for 2GB. Satchet packs start at Rs 11 per day for 10 MB of download and Rs 39 for 3 days for 150 MB. Local video calls cost 5 paise per second. Airtel, on the other hand, has a daily pack of Rs 9 for 10 MB and its Flexishield prepaid pack for heavy data users costs Rs 675 for 1.2GB. (again Bangalore as a circle was chosen). Its volume-based 3G Value pack starts at Rs 13 for 20 days with a charge of 15 paise per 20 KB. Will you shift to 3G at such rates?